I would like to begin this blog post by cutting (pun!) straight to the point. It drives me mad to have a client sit in my chair and immediately ask, “How long have you been doing hair?” Cue the maniacal laughter. I’d like to answer for all the stylists at Enso – we wouldn’t be employed as stylists at the top Aveda salon in Lancaster County if we weren’t good. 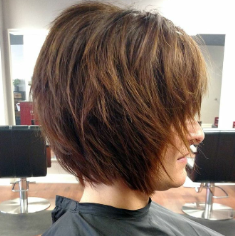 The predominant goal at Salon Enso is that you always leave happy with some killer hair. The ultimate test however is if you can style and maintain those Instagram worthy locks at home. Remember the best haircut means NOTHING unless it offers you ease of styling. No one should ever have to fight for hours to get their hair to do what they want! Positive mind, positive vibes, positive life. This message graces our chalkboard for January – the month of resolutions. I skipped out on blogging last month. I’m disappointed with myself because it was my goal for myself to do this consecutively for YEARS. I almost hit that goal of 24 months of consistency! Then December struck along with all the merriment and craziness it housed.